Florida Farm Bureau will hold its state Young Farmers and Ranchers Leadership Conference themed “Rooted in Agriculture,” at the World Golf Village Renaissance St. Augustine Resort, July 13-15, 2018. A mix of more than 300 Generation Zs and Millennials will attend various leadership development seminars at the three-day leadership conference so that they can better promote agriculture in their own communities. Retired football player, Jason Brown, will welcome attendees at a Friday evening awards banquet by sharing his inspirational story of trading cash and fame for his passion to support hunger relief. “Shark Tank” survivor Johnny Georges will share his experience and success of the Tree T-Pee during lunch on Saturday afternoon. Breakout sessions will address an array of engaging topics, including diversifying your operation, marketing your product, tackling social media, creating agricultural videos and tips on running for political office. A conference agenda is available on the event page. The semi-final rounds of Florida Farm Bureau’s 2018 Discussion Meet competition will also talk place on Friday, giving young farmers the opportunity to actively discuss and exchange ideas in a simulated committee meeting. The Final Four Discussion Meet contestants will be announced on Sunday, July 15, and will advance to the Florida Farm Bureau Annual Meeting in October. 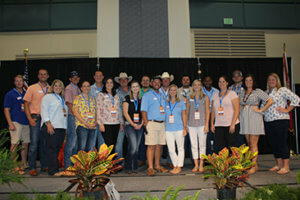 Florida Farm Bureau’s Young Farmers and Ranchers are members between the ages of 18 and 35 who volunteer their time to speak out for agriculture in their local communities. They support hunger relief through the American Farm Bureau’s Harvest for All Campaign and have donated 24.6 million pounds of fruits and vegetables and canned goods to assist food-insecure Floridians this year.